How Deeply is Iran Enmeshed in Syria? The Fateh 110 is a short-range ballistic missile and one of the most accurate in Iran’s arsenal. Iran unveiled an upgraded version last year. Its range is about 185 miles, which makes it particularly useful for Hezbollah against Israel—and, in turn, for Iran’s regional strategy. In response to the Israeli strikes, Iranian Minister of Defense Ahmad Vahidi warned, "The inhumane measures and adventures of the Zionist regime in the region will surge anti-Zionist waves and shorten the life of this fake regime…. [Israel's] attack in Syria, which occurred with a green light from the U.S., pulled the curtain back on the relationship between the mercenary terrorists and their supporters and the Zionist regime." Vahidi also called for a regional response against Israel. Tehran "condemns the Zionist regime attack and recommends the regional countries to wisely stand against such aggressions," he told Fars news agency. The reaction from Vahidi, who is a senior Islamic Revolutionary Guards Corps commander, may also signal a possible Iranian response. The Revolutionary Guards have taken the lead in training Hezbollah and aiding Syria militarily since the 1980s. In a rare public comment about Iran-Syria military ties, Gen. Ahmad Reza Pourdastan, commander of Iran’s regular Army ground forces, said the Islamic Republic is prepared to provide military training to the Syrian Army. “As a Muslim nation, we back Syria, and if there is need for training we will provide them with the training. But we won’t have any active involvement in the operations,” he said, according to the Islamic Republic News Agency. Israel's direct action against the Iranian and Hezbollah targets in Syria highlights the role that Iran and its allies increasingly play in the Syrian conflict. A new report entitled "Iranian Strategy in Syria" by the Critical Threats Project at the American Enterprise Institute and the Institute for the Study of War outlines Iran’s role and goals in Syria. The following is an interview with Will Fulton, one of the report’s three co-authors. Two years after Syria’s uprising began, what role is Iran now playing? What specifically is it providing to Syria? 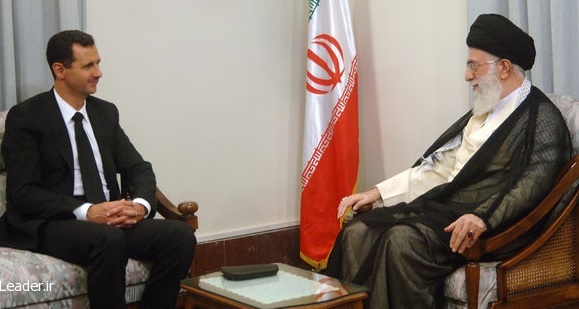 Iran continues to be Syrian President Bashar Assad’s key ally and source of support in this conflict. Iran is conducting an extensive, expensive, and integrated effort to provide the Assad regime with military, intelligence, economic, and diplomatic support. Iran’s security and intelligence services are training and advising Assad’s state military and security organizations, providing essential military supplies to the Assad regime, and directly supporting pro-government Syrian shabiha militias. Iran’s partners and proxies, including Lebanese Hezbollah and Iraq-based Shi’a militant groups — such as Kata’ib Hezbollah and Asa’ib Ahl al Haqq — have also taken on a more direct combat role in recent months. These groups have made their presence and activities known on their social media outlets and by holding public events honoring members who have died while fighting in Syria. Hezbollah Secretary General Hassan Nasrallah’s speech on April 30, 2013, in which he warned that Syria has “real friends in the region and in the world who will not allow Syria to fall into the hands of America or Israel,” was further indication that Iran and its partners are resolved in their support for Assad. Which of Iran’s security organizations have provided support to Assad? Iran has committed its most important security organizations to the Syrian conflict. The Islamic Revolutionary Guards Corps’ Ground Forces (IRGC), its Quds Force, and Intelligence Organization have deployed senior personnel to Syria in support of the Assad regime. So have Iran’s Law Enforcement Forces and Ministry of Intelligence and Security. The forward deployment of high-ranking IRGC Ground Forces commanders is particularly unusual. The Quds Force is Iran’s traditional foreign military arm, while the IRGC Ground Forces are responsible for internal security and conventional operations inside of Iran. The evolution of an expeditionary training capability relying on the IRGC Ground Forces in addition to the Quds Force is a notable expansion of Iran’s ability to project its influence and military force well beyond its borders and immediate neighbors. How does Iran move personnel and materiel into Syria? Aerial resupply is the most critical component of Iranian material support to Syria. Opposition gains in Syria have interdicted many ground resupply routes between Baghdad and Damascus, and the relative scarcity of Iranian port-visits in Syria suggests that Iran’s sea-lanes to Syria are more symbolic than practical. The air line of communication between Iran and Syria is thus a key vulnerability for Iranian strategy in Syria. Iran would not be able to maintain its current level of support to Assad if this air route were interdicted through a no-fly zone or rebel capture of Syrian airfields. What are Iran’s goals and strategy in Syria? First and foremost, Iran aims to keep Assad in power for as long as possible. It is training and supporting the Syrian security apparatus to achieve this goal. But Iran is also hedging against the failure of this strategy by setting conditions to ensure Tehran’s ability to use Syrian territory and assets to pursue its regional interests should Assad fall. To that end, Iran is complementing its support for Syrian state security institutions with assistance to pro-government militias to develop proxies that may survive Assad. This aspect of Iran’s approach is congruent with Tehran’s longstanding efforts in Lebanon and Iraq, where it also built Shiite militias to ensure that its interests were protected even in the absence of effective or pliable host states. Why has Iran invested so heavily in supporting Assad? Syria is vital to Iran’s strategic interests in the Middle East. It has long been Iran’s closest state ally. The Assad regime has provided crucial access to Iranian proxies, including Lebanese Hezbollah, Hamas, and Palestinian Islamic Jihad, which allows Iran to move people, weapons, and money to these groups through Syrian territory. Iran has invested in Syria as a strategic partner as part of its deterrence strategy on Israel and as an Arab ally in its rivalry with Turkey and the Persian Gulf states. Iranian officials have made the centrality of Syria to Iranian regional interests well known. “Syria is the golden ring of resistance against Israel, and if it weren’t for Syria’s active government the country would become like Qatar or Kuwait. Iran is not prepared to lose this golden counterweight,” Ali Akbar Velayati, senior foreign affairs adviser to Supreme Leader Ali Khamenei, said on March 27, 2013. The Syrian conflict has already constrained Iran’s influence in the Levant. The fall of the Assad regime would further reduce Tehran’s ability to project power. Iran’s strategy in Syria thus far indicates that it is determined to defend its interests in this conflict. Click here for the new report, "Iranian Strategy in Syria," by the Critical Threats Project at the American Enterprise Institute and the Institute for the Study of War.